Maybe someday this guitar will be really restored to it's original state, thought some of the mods are sadly irreversible. Exceptional woodwork, but such an unfortunate idea. The fretboard thickness is weird, but even more weird are the top edges, the laquer will make the trick more evident overtime, and pray for no armwear.. If it plays well (which he has indicated it does - before and after) and he likes it, it doesn’t matter what anyone else thinks. Everything else is pointless chatter. Man... I'm sorry, but what the hell did you just do? Except if you are the owner and that's what you want and have the skills to pull it off. the OP for the detailed report, it was entertaining. An interesting technical exercise that should have remained in the theoretical realm. The instagram photo of the headstock looks very unconvincing. We COULD clone Carrot Top, but SHOULD we? I could just as well dismiss your opinion as pointless chatter. What a weak defense. Thanks for contributing nothing to the discussion except insults. I'm sure the poster has a thick skin to manage any kind of opinion, probably much more than some commentators here, and I'm sure he was expecting this (since he's receiving same comments in the other places where he's posting the story). This is such cool work. Im addicted to your Instagram and demand more info and pictures. Also thanks to you this is now a playable guitar with the neck fix done! My hats of! And an awesome job. Now we need to hear the tone! The removal of the ebony was a little painfull. I love ebony fretboards. And I would never had done it i did love how it was before ( love 3 humbucker guitars). But the guitar is not mine ( darn) and the work done is amazing. I would not have done it even if i could (i wish) but than I love originalitty. I respect that people think and do different. Not thinking of what it was it is an amazing job in my eyes. I guess it took some guts and thinking over before he started this. Respect for that. Yes. This thrilling bitchfest will never be the same after I pointed out that the owner is happy with the results and no one else’s opinion matters. 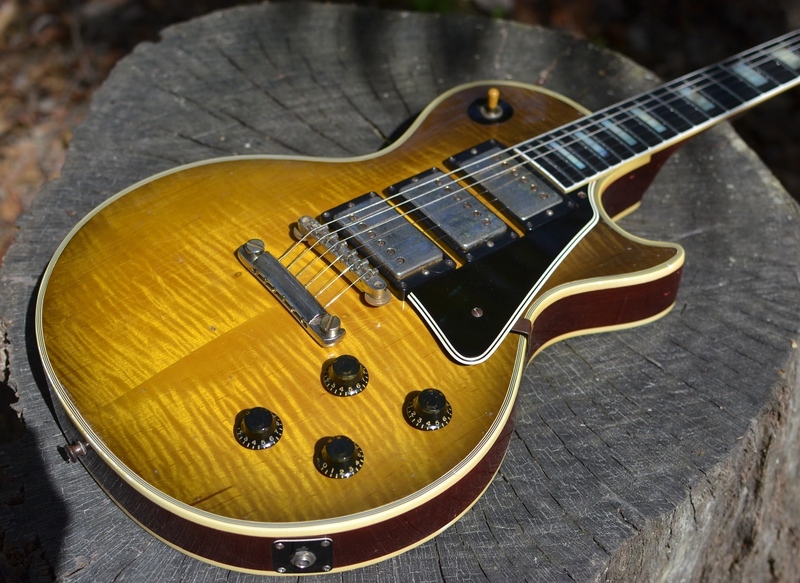 - Original 50's burst spec body & neck. Sweet! I don't see the problem here. Sad at the end result (bourbon burst R8) but it's OP's guitar after all. Great job on the conversion and thanks for the pics. The headstock logo looks too clean cut like a vector image. The originals have a sloppy charm imo. 3 pickup customs are awesome, middle position is great IMO/use and absolutely sound good. You could have the same result without destroying an original LPC by buying from a luthier or getting a 2018 brazilian reissue, do a HM or whatever. But it´s the owner´s decision to do what he did and he did it very well. He was the proud owner of a great almost original 1960s LPC. Now he is the owner of a 1960s LPC conversion. But it is neither a restoration, nor is it a burst. I think a lot of you guys don’t understand that this is Yuuki’s business. He chases down potential conversion candidates, does the work & sells them or does the work on behalf of owners & charges an appropriate fee. The point is, you guys have created a market & a demand for Conversions and because of that people like Yuuki will fill that demand. He’s not the only one either. Now I’m not actually referring to members here in this Thread, I’m talking about in general. When there is a demand, there is an opportunity to make money. Me, I like Replicas & I also prefer restorations but everyone is different. I thought about doing a Conversion but it’s not me. I also like Black Customs & I also know that there are a lot of crappy Vintage Guitars around. Hey they’re not all good just because they are Vintage. So many good stories to write about but I don’t feel the need to justify my own interests. So anyway, if you like the work great. If you don’t maybe don’t pay any attention & move along. I actually like his work and think he has done a great job. But I think it isn´t correct to call it a "burst restoration", it is a "LPC to burst conversion", no matter how well it is executed. However, it´s his right to do with the guitar whatever he wants to. And I don´t have to like it. And if there are people buying it, well, why not. I just don´t like the name of the thread. This guitar isn´t a burst and it will never be a burst. - Nobody really likes those middle pickup. Middle PU’s are fine in actual fact. All you need to do is to drop the middle PU a little if it interferes with your picking / playing IMHO.